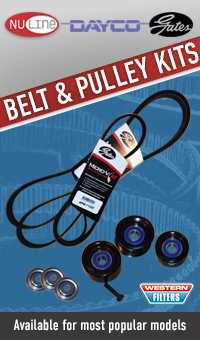 Top Quality Balancers, Belts & Pulleys in stock - also in Kits !! Dayco / Nuline: Dayco Nuline engine pulley design replace moulded plastic with SG Iron (the same material used in harmonic balancers) or pressed steel offering far greater strength and resistance to wear when exposed to dirt. Special attention in manufacture is given to belt face contours and dimensions to ensure drive belt compatibility. All ball bearings used are from OEM manufacturers and feature C3 rated high speed races, high temperature lubricant and heavy duty silicone seals for maximum service life at high RPM's. Gates: Gates has been producing the highest quality automotive products for over 100 years, and supply the world’s largest car manufacturers with automotive products that they need. This is particularly so in the Accessory Belt Drive System, where Gates is a leading supplier of drive belts and components to the car manufacturers. The Gates DriveAlign Idler Pulley is made to the same high standards and specifications as the parts supplied to the car manufacturers (OE). Gates has a complete line of idler pulleys for V- belt drives. Bando: Bando is a global leader in manufacturing world class power transmission belts to both industrial and automotive OEMs’ as well as an international network of industrial and automotive aftermarket distributors.